UPDATE: December 21, 2018: The International Code Council has released the preliminary results of its last online governmental consensus vote, and, pending certification of the results, the package of 14 new tall wood construction code change proposals will be incorporated into the 2021 International Building Code. Eleven of the proposed changes were debated at the ICC’s public comment hearings this past October at the council’s conference in Richmond, Virginia, and subjected to online voting. Three, according to a spokesman for the American Wood Council, were approved through the consent agenda at the conference. Type IV-A – maximum 18 stories, with gypsum wallboard on all mass timber elements. Type IV-B – maximum 12 stories, limited-area of exposed mass timber walls and ceilings allowed. Type IV-C – maximum 9 stories, all exposed mass timber designed for a two-hour fire resistance. The ICC will continue to develop new codes, including those for mass timber, into 2019. The 2021 IBC is expected to be released in 2020. “Mass timber has been capturing the imagination of architects and developers, and the ICC result means they can now turn sketches into reality. ICC’s rigorous study, testing and voting process now recognizes a strong, low-carbon alternative to traditional tall building materials used by the building and construction industry,” said Robert Glowinski, American Wood Council president and CEO. Fourteen proposed code changes that would expand tall wood construction in the U.S. survived the International Code Council's public comment hearing at the organization's annual meeting in Richmond, Virginia, last week, and the full membership will now vote on whether the changes will be incorporated into the 2021 edition of the International Building Code, according to the American Wood Council. The 14 proposed changes, which would allow wood high-rises up to 18 stories, deal with sprinkler water supply, height, allowable area, fire separation, performance, sealants and adhesives, fire and smoke protection, noncombustible protection, membrane buildings, fire districts, owner's responsibility and fire safety during construction. The rules would also add three new types of construction — Type IV-A, Type IV-B and Type IV — that range from an allowable height of 85 feet to 270 feet based on the level of fire resistance. The ICC membership will now vote on the changes, with the results expected to be revealed in December. In response to discussions that took place during the public comments hearing, the Ad Hoc Committee on Tall Wood Buildings issued a list of responses to common concerns, including performance testing and engineering; construction above fire department access; level of resiliency and fire protection compared to noncombustible materials; the potential mischaracterization of mass timber's charring effect as noncombustible; and the lack of full-scale fire testing. Oregon has already incorporated tall mass timber construction into its building codes, making it the first U.S. state to allow buildings taller than six stories without a special review process. 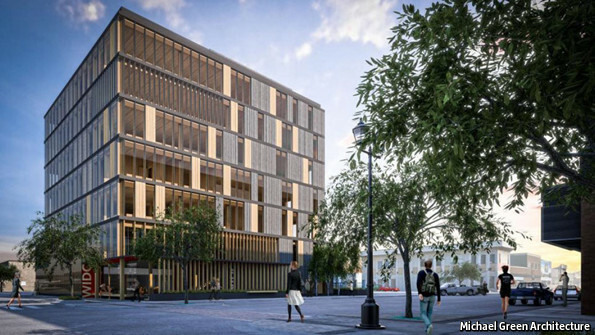 In August, the Oregon Building Codes Division issued a statement of alternate method (SAM), which introduced three new types of construction for nine-, 12- and 18-story tall wood structures. Many states incorporate all or part of the IBC into their construction regulations, but, if there is any doubt on the part of local officials as to the safety of wood high-rises, states can choose not to include the new provisions. And advocacy groups on both sides of the tall wood debate are likely lining up to influence state and local decision making in this regard. The Portland Cement Association is an outspoken opponent of tall wood construction and recently sponsored an online survey that showed 75% of the 800 respondents believed raising the allowable height of wood buildings was a bad idea because wood was not strong and required more maintenance than other materials (33%); was a fire hazard (31%); would weaken and fail faster than other materials (10%); and would be less likely to hold up in natural disasters like earthquakes and hurricanes (8%).